Yonked :: Diary of a New Home: The play is done! Long live the play! Well, the play is over. It was a ragtag last minute dash to the finish to create the play (the first performance was also the first run-through without stopping!) Nevertheless, we got lots of great comments, a lot of people really seemed to dig my work, and I really enjoyed working with everybody in the play. So-- win, win, win. Once again, it's very difficult to encapsulate this sprawling novel in a 2 hour play-- so not all of the complete stories of the characters I played were completely seen throughout the play. I highly recommend reading the book if you haven't. As Colonel Kearney (pronounced, surprise, surpise, Carny): a Southern-fried P.T. Barnum. There is more than a passing resemblance to W.C. Fields. 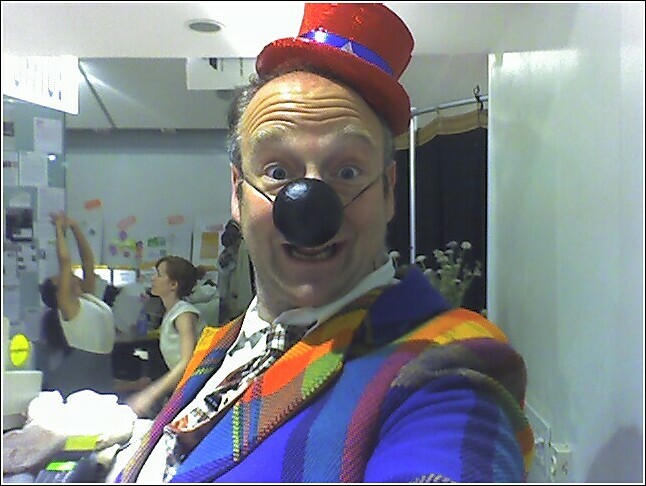 As Buffo the Great, the leader of the clown troupe who over the course of the play slowly goes mad. I really like the hat and jacket that they found for me-- the nose, I made myself. Comments on "The play is done! Long live the play!"